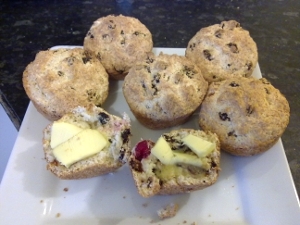 I just made these delicious muffins using a quick and simple recipe that I’m fairly sure I stole from my mum! Lightly beat the two eggs and mix them with the milk. Add this liquid to the dry ingredients and mix well. Spoon into a greased muffin tray (makes about 6 good-sized muffins, or 10-12 mini-muffins). Bake for 20 minutes at 180 degrees Celsius. Enjoy! The halved one shown here has butter spread on it, but they’re just as nice plain! This entry was posted in Recipes and tagged gluten free, snack.